Among the growing portfolio of marine customers, Cobalt Boats was an early proponent of PP Honeycomb, a nod to the core’s design and manufacturing quality as being consistent with Cobalt’s mission to build world-class performance boats. Cobalt is known for their tireless efforts in creating the most innovative, well engineered and best performing boats imaginable. By arousing the passions of boat owners, Cobalt has carved a distinctive and enviable niche in the performance boat market. While the Cobalt-Plascore relationship began many years ago, and includes PP Honeycomb in hulls, decks, and components, Cobalt’s latest innovation exemplifies the value PP Honeycomb brings to product design. 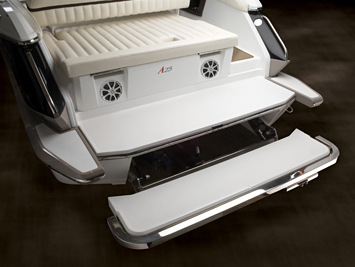 With the introduction of the first model in its new “A” line, Cobalt Boats has returned to its marine design roots with fundamental enhancements of the boating experience in the traditional “extended running surface.” Cobalt has emphasized the depth of “genuine innovation” on the A25, going well beyond window dressing to offering specific new ideas for making boating more enjoyable. Incorporating technologies learned in building Cobalt yachts, the A25 presents a profile never before seen in its class. The hull’s shape requires a five-piece mold, a no-shortcuts exercise in hand craftsmanship. Because of new structural design mandated by the A25’s optional deployable swim step, the running surface is more that of a 27-footer, with reduced bowrise upon acceleration, more stability in turns, and even offers more comfort at cruise for all aboard. Plascore’s new PP Honeycomb – Infusion Grade has provided Cobalt engineers with a core solution for one of the most intriguing and eye-appealing aspects of the new A25. 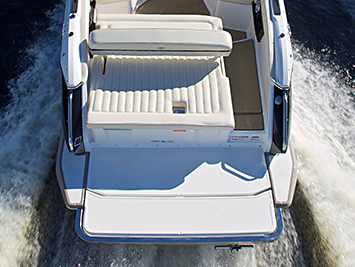 A quantum leap in safety and convenience in a runabout, the A25’s swim platform stretches an extravagant 39 inches aft and the optional step deploys 10 inches below the water’s surface for easy entry to and from the water. While certainly not intended to be an elevator, the step will support a full ton of weight in any position up or down, thanks to oversized hydraulics, in fact, the same type of cylinder used to raise and lower the outdrive. PPP Honeycomb – Infusion Grade has helped eliminate unwanted exotherms during infusion, reduced product weight and scrap material while also improving overall strength. PP Honeycomb totally eliminated the need for the stainless tubing support and allows the part to be produced using L-RTM instead of bagging. PP Honeycomb – Infusion Grade is designed specifically for Light RTM and Vacuum Infusion closed molding, which eliminates VOC emissions and can produce higher quality parts with closer tolerances. As an ABA Supplier of Choice, Plascore provides technical assistance, prototyping, testing, customer-specific sheet dimension and value-added fabrication. Unlike other honeycomb core suppliers, Plascore retains total control over PP Honeycomb manufacturing and distribution, including a dedicated production facility and IS0-9001: 2008 certification. As a result, Plascore PP Honeycomb is gaining preference as a superior alternative – in performance and quality – to balsa, foam and off-branded honeycomb. In short, world-class quality for world-class boats. FFor more information visit Cobalt Boats at www.cobaltboats.com.